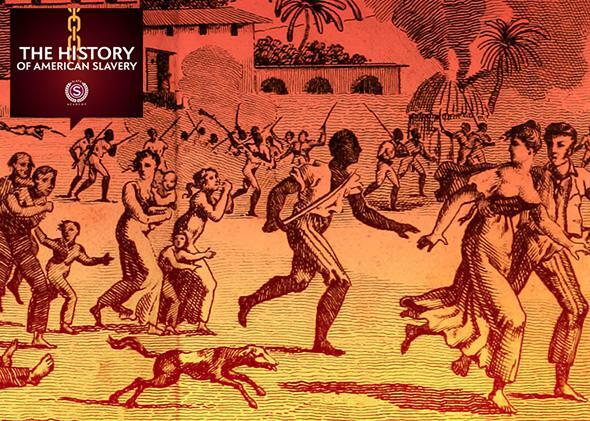 The most successful slave rebellion in history created an independent Haiti and secured the Louisiana Purchase and the expansion of North American Slavery. Burning of Cape Francais during the Haitian Revolution. This article supplements Episode 5 of The History of American Slavery, our inaugural Slate Academy. Please join Slate’s Jamelle Bouie and Rebecca Onion for a different kind of summer school. To learn more and to enroll, visit Slate.com/Academy. Excerpted from The Half Has Never Been Told: Slavery and the Making of American Capitalism by Edward E Baptist. Published by Basic Books. Spain’s stubborn possession of the Mississippi’s mouth kept alive the possibility that the United States would rip itself apart. Yet something unexpected changed the course of history. Napoleon had his own visions. He ignored Jefferson’s initial offer for the city at the mouth of the Mississippi. So the president sent future president James Monroe with a higher bid: $10 million for the city and its immediate surroundings. Yet, in the end, Paris would not decide this deal. When Le- Clerc’s massive army had disembarked in Saint-Domingue, the French found Cap-Francais a smoldering ruin, burned as part of scorched-earth strategy. LeClerc successfully captured Toussaint by deception and packed him off to France to be imprisoned in a fortress in the Jura Mountains. Resistance, however, did not cease. The army Louverture had built began to win battles over the one Napoleon had sent. French generals turned to genocide, murdering thousands of suspected rebels and their families. The terror provoked fiercer resistance, which—along with yellow fever and malaria—killed thousands of French soldiers, including LeClerc. Even today, most U.S. history textbooks tell the story of the Louisiana Purchase without admitting that slave revolution in Saint-Domingue made it possible. And here is another irony. Haitians had opened 1804 by announcing their grand experiment of a society whose basis for citizenship was literally the renunciation of white privilege, but their revolution’s success had at the same time delivered the Mississippi Valley to a new empire of slavery. The great continent would incubate a second slavery exponentially greater in economic power than the first. *Correction, Aug. 7, 2015: This article originally misstated that at the outset of the Haitan Revolution Saint-Domingue occupied the eastern third of Hispaniola. It occupied the western third. Excerpted with permission from The Half Has Never Been Told: Slavery and the Making of American Capitalism by Edward E Baptist. Available from Basic Books, a member of The Perseus Books Group. Copyright © 2014. 1. Berquin-Duvallon, Travels in Louisiana, 35–37. 2. Alexander DeConde, This Affair of Louisiana (New York, 1976), 61– 62, 107–126; William Plumer, William Plumer’s Memorandum of Proceedings in the U.S. Senate,1803–1807, ed. Edward Sommerville Brown (Ann Arbor, MI, 1923). 3. Carolyn Fick, The Making of Haiti: The St. Domingue Revolution from Below (Knoxville, TN, 1990). 4. Michel-Rolph Trouillot, Silencing the Past: Power and the Production of History (Boston, 1995); Susan Buck-Morss, “Hegel and Haiti,” Critical Inquiry 26 (2000):821–865; Alfred N. Hunt, Haiti’s Influence on Antebellum America: Slumbering Volcano in the Caribbean (Baton Rouge, LA, 1988). 5. C. L. R. James, The Black Jacobins: Toussaint Louverture and the San Domingo Revolution (New York, 1963). 6. Stephen Englund, Napoleon: A Political Life (New York, 2004); Laurent DuBois, Avengers of the New World (New York, 2004); Robin Blackburn, The Overthrow of Colonial Slavery (London, 1988). 7. Roger Kennedy, Mr. Jefferson’s Lost Cause: Land, Farmers, Slavery, and the Louisiana Purchase (New York, 2003). 8. Jefferson to Robert Livingston, April 18, 1802; Jon Kukla, A Wilderness So Im- mense: The Louisiana Purchase and the Destiny of America (New York, 2003), 235–259. 9. DeConde, Affair of Louisiana, 161–166. 10. P. L. Roederer, Oeuvres du Comte P. L. Roederer (Paris, 1854), 3:461; Comté Barbé-Marbois, The History of Louisiana: Particularly of the Cession of That Colony to the United States of America, trans. “By an American Citizen (William B. Lawrence)” (Philadelphia, 1830), 174–175, 263–264. 11. Dubois, Avengers of the New World, 297–301. 12. Christopher Brown, Moral Capital: Foundations of British Abolitionism (Chapel Hill, NC, 2006). 13. DeConde, Affair of Louisiana, 205–206; Jared Bradley, ed., Interim Appoint- ment: William C. C. Claiborne Letter Book, 1804–1805 (Baton Rouge, LA, 2003), 13; Alexander Hamilton, in New-York Evening Post, July 5, 1803, Papers of Alexander Hamilton, 26:129 –136. An exception to historians’ cover-up: Henry Adams, History of thAdministrations of Jefferson and Madison (New York, 1986 [Library of America]), 1:2, 20 –22. Cf. Edward E. Baptist, “Hidden in Plain View: Haiti and the Louisiana Purchase,” in Elizabeth Hackshaw and Martin Munro, eds., Echoes of the Haitian Revolution in the Modern World (Kingston, Jamaica, 2008).